Having kids can be quite a handful, especially when you are staying at home with them. Of course, you wouldn’t be able to watch over them the entire time, given that there are household chores to do, or even your job if you work at home. That is why it is important to keep your little ones occupied while, of course, making sure that they are safe and away from harm. That being said, here are a few tips on keeping your preschooler busy in safe and easily manageable ways. Keep in mind that some things listed down here are only suitable for kids in preschool—that is, kids aging 4 and up—however, with some tweaking, you might be able to find that all of these can also apply for toddlers as well. Art is a good way for your little ones to spend time on while being able to express themselves creatively, and probably even make an output in the end. For this, you can spread a huge manila paper—or many pieces of used paper with blank sides taped together—on the floor or over your kid’s play table, and pour in some non-toxic drawing and coloring materials. For preschoolers who are more trained, you can even throw in some kids’ glue, a pair of kids’ scissors, and some colored paper, in order to allow them more room for their creative imagination. If you have a tablet designed for kids, then it will be a great idea to download educational games and even stories on it for your little ones. These will allow them plenty of time to have fun, while also learning in the process. To protect their eyes, you can allow an hour or two for play, and, after a meal or nap time, plug in a pair of soft earphones and have them listen to an audio story. If you have an enclosed space outside your house that you can clearly see from the inside, then it will be a good idea to let your child play outdoors. Put out a kiddie pool, turn on the garden hose a little bit, and set some toys outside, and you’ve got yourself a busy kid. They can have fun and even learn and observe their surroundings. 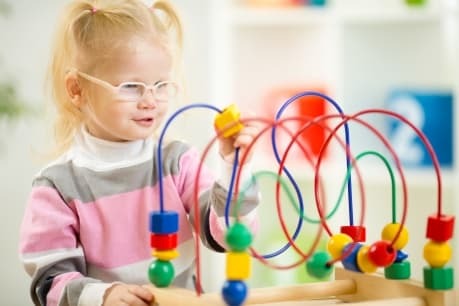 If you would need to run an errand and couldn’t leave your little ones at home or take them with you, then it would be best to seek out a daycare where your kid can be cared for and supervised, while still being able to have fun and keep themselves busy in activities they will enjoy doing. If you are seeking out for a day care center in New York, trust us at Tender Years Childcare. We offer services in child care in Bronx, New York such as daycare, preschool, kindergarten, after-school programs, and even summer camp. At Tender Years Childcare, we recognize the children’s needs and learning capacities throughout various age groups, which is why we carefully designed our programs to allow your little ones to learn without getting bored or frustrated, and of course, center their day on play. Share this information with a fellow parent who wants to know.